From Lauren: I recently moved to Seattle and transferred to Bastyr University. While I’m busy settling into my new schedule, I’m excited to host some special guest posts. Today’s post comes from Ariana at And Here We Are. Ariana recently released her grain free digital cookbook And Here We Are At The Table. In a word, it is delightful! 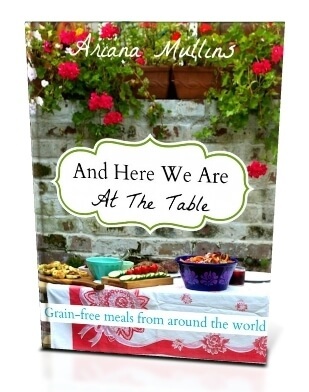 If you want to infuse your grain free meals with international flavor, you’ll love this book. Ariana included a coupon for it below! My family is currently living in the English countryside, and elderberries are everywhere right now, ripe for the picking! There are a lot of ways to use elderberries, and it’s no coincidence that they are abundant right at the start of cold and flu season. 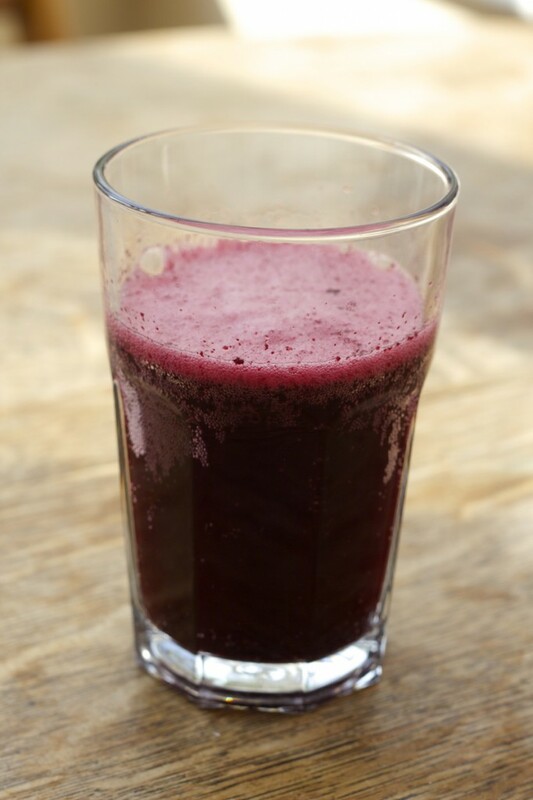 Fermented fruit sodas are really simple and fun to make, and they are delicious. I do a lot of home brewing of ciders and wines, but it’s really nice to have something quick and kid-friendly on-hand, too. This is a great way to use foraged berries. You can use this method for any fruit, really, and it’s very similar to my method for making fermented rhubarb & honey soda. 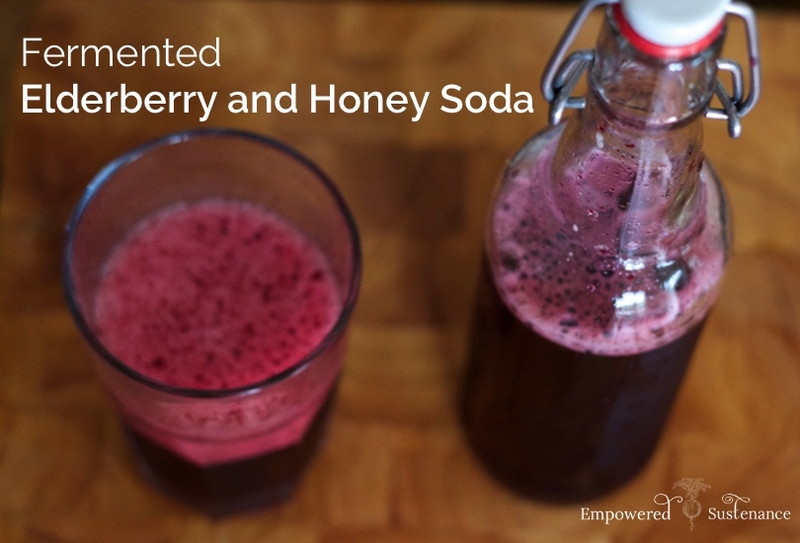 What is extra-special about this Elderberry & Honey Soda is that it’s a great one to have around during cold and flu season– both the honey and the elderberries are powerful anti-virals. 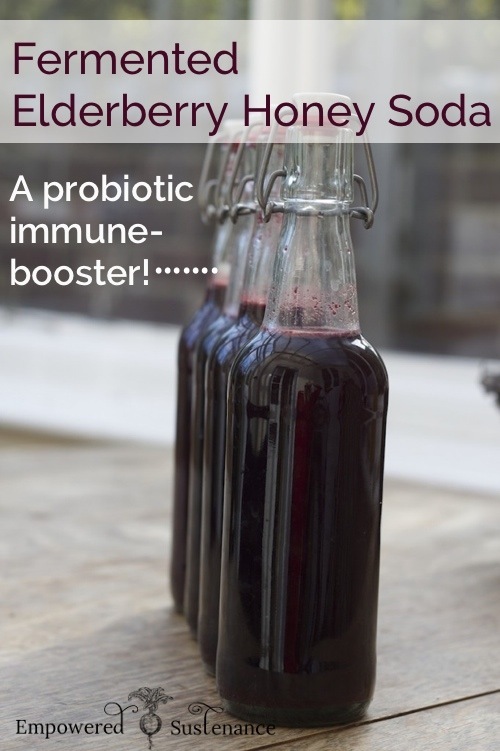 The soda is a probiotic, so it’s a very well-rounded, healthy drink for the whole family! Put the elderberries into a pot, and add 4 cups of water. Bring to a simmer. Strain out the elderberries. Press with a spoon to extract as much juice as possible. Add the honey or sugar and stir until dissolved. I used about ¾ cup, which made it very, very sweet. Keep in mind that the sugars will be digested to create the fizz, so you do want to start with it much sweeter than you would like the soda to be. You can also just save this as blackberry syrup! This is a nice way to make another batch later– you can freeze, then dilute when you want to make another batch, quickly. Dilute the syrup with water to get a good juice flavor and consistency. Pour it into your swing-top bottles, and store in the fridge. (The type of bottle is important, as they allow the ferment to give off some small amounts of Co2 and won’t explode.) You could leave them out at room temperature if you’d like to drink them sooner, but I usually pop them into the fridge to slow down the fermentation process. You will want to drink them within a few weeks, or risk losing most of your Elderberry Soda to the “geyser effect.” If you’re storing it for a while, I’d just check in now and then to see what kind of pressure is building up. Your beverage will get drier, more tart and fizzier the longer you wait. It will eventually develop more of an alcohol content, too, so you might want to taste it before giving it to your kids if you’ve been storing it for a while! Enjoy! Thank you, Lauren, for letting me share this recipe with your wonderful readers! I wanted to let you all know that I just published a digital cookbook full of delicious and unique grain-free recipes, And Here We Are At The Table. Part memoir, part travelogue, and full of vibrant recipes from around the world, it is all about good food and the experience of a welcoming, abundant table. I’d like to offer you a special 20% discount to Empowered Sustenance readers for the next two weeks– just use the code EMPOWERED at checkout! Learn more about the book here. Ariana Mullins is an American writer, cook, explorer and photographer. She shares her family’s stories of challenge and adventure as expats in Europe, as well as inspiration for living a simple and meaningful life. She has a passion for restoring lost kitchen arts and loves to share her experiences in foraging, butchery, home brewing and anything new she can get her hands on in her English kitchen. Connect with her on andhereweare.net, Facebook, Pinterest, and Instagram. This looks so good. I have never actually tried elderberry before, so I think adding it in something like a soda is great – you get the full infused flavor of the berry at the end of the product. The flavor will be concentrated and you’d really get the full effect of trying it out for the first time. I can’t wait to try my hand at this at home. Thank you again for sharing! I wonder if this can be done without cooking the berries. Can Kombucha be used for the starter? It can, but know that it will likely “call in” a wild yeast and the kombucha “and friends” can ferment faster than normal kombucha and make more alcohol than normal (probably still not 3% ABV in several weeks). The speed includes a second ferment that can be shorter. Some yeasts are more cold tolerant so the refrigerated life may shorten or have a geyser effect or explosions of bottles. I have found this to be consistent with any fruit or flower added to kombucha during the fermentation process. Though some spices can kill kombucha. I’ve found chia and cinnamon seem to kill mine. I came across to your blog, and find this post by Pinterest, I have the same question as Catherine, I have been making Kombucha, I wonder if I can use it as the culture? Hello, I’ve been enjoying your blog! For this recipe, could one use a ginger bug? I just bottled my elderberry/ginger/cinnamon/honey soda. 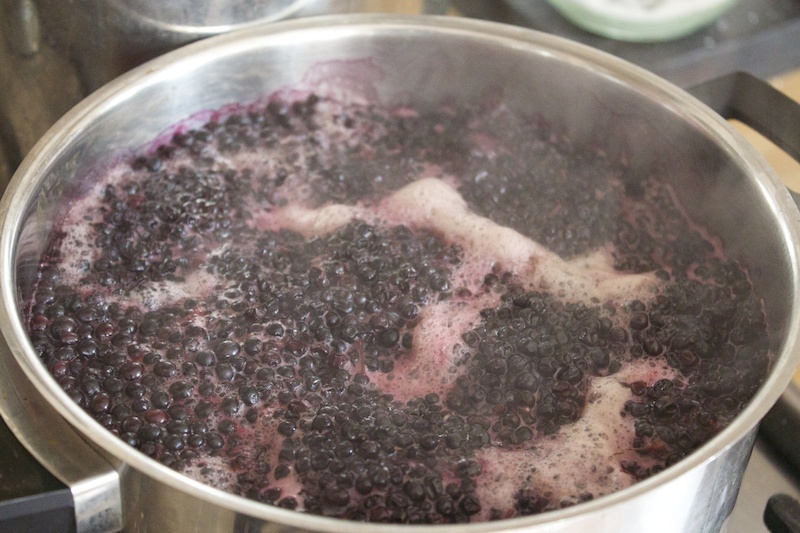 I used wild elderberry yeast starter that came to ferment in 5 days, then cooked berries etc, strained, added honey and fermented that for 3 days. I stirred it down for 3 mornings…it was quite fizzy, then the 4th morning it was quiet. I stirred, let it settle, then glass bottled with new (very tight!) swing caps. The recipe I used said to let it sit at room temp a few days…I left them outside. I’m afraid they will explode. How do I know when to bottle and cap?